Jews comprise less than two percent of the US population and an infinitesimal proportion of the global population. More than 93% of them live in Israel, the EU, Canada, or ANZUS And, yet, the normal mechanisms of protecting minorities combined with specialized groups like the Anti-Defamation League, the Simon Wiesenthal Center, etc. have been deemed inadequate by the US Congress. Even as Jews wage genocide against the indigenous people of Palestine, Congress mandated the creation the Office of the Special Envoy To Monitor and Combat Anti-Semitism under the Global Anti-Semitism Review Act of 2004. The Special Envoy and his office are sui generis in the US State Department. In the epigraph to the section entitled "COMBATING ANTI-SEMITISM," we are told on page 62, "The new anti-Semitism threatens all of humanity. The Jew-haters must not pass." Who'd a thunk it? All of humanity is under threat but it's not global warming, famine, global corporatization, HIV/AIDS, war and nuclear proliferation, or the global 'credit crisis' that are the threats. No, it's the new and improved "anti-Semitism," now with colorfast bleach and brightening agents. Where is SuperMensch when you need him? Fortunately, the same epigraph by a UK parliamentarian assures us: "A counterattack is being organized ...." We may yet be saved, folks. The first page of text in the "COMBATING ..." section helpfully reminds us that, "Laws can be among the most powerful tools for fighting anti-Semitism." Yes, indeedy. But how does the US State Department know when one is an "anti-Semite"? More importantly, are you, dear reader, guilty of the "new anti-Semitism"? Just take a look at the handy excerpt from the State Dept. web site below and judge for yourself before you are judged. Astute readers will note the existence of some overlap with The Nine Commandments of the Holocaust Religion. Working definition: "Anti-[S]emitism is a certain perception of Jews, which may be expressed as hatred toward Jews. 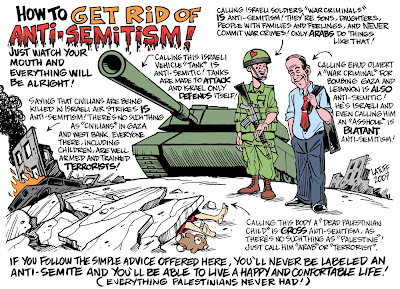 Rhetorical and physical manifestations of anti[-S]emitism are directed toward Jewish or non-Jewish individuals and/or their property, toward Jewish community institutions and religious facilities." In addition, such manifestations could also target the state of Israel, conceived as a Jewish collectivity. Anti-Semitism frequently charges Jews with conspiring to harm humanity, and it is often used to blame Jews for "why things go wrong." It is expressed in speech, writing, visual forms and action, and employs sinister stereotypes and negative character traits. Making mendacious, dehumanizing, demonizing, or stereotypical allegations about Jews as such or the power of Jews as a collective - such as, especially but not exclusively, the myth about a world Jewish conspiracy or of Jews controlling the media, economy, government or other societal institutions. Denying the fact, scope, mechanisms (e.g., gas chambers), or intentionality of the genocide of the Jewish people at the hands of National Socialist Germany and its supporters and accomplices during World War II (the Holocaust). Denying the Jewish people their right to self-determination (e.g., by claiming that the existence of a State of Israel is a racist endeavor).